November | 2014 | Poverty, Agony, Distress & Want! If you’re thinking it’s been a while since you’ve heard from me, you’d be correct. It’s been a very, very busy fall; hence the reason why I’m so tired. We are now into November and I can’t believe how quickly the last two months have flown by. What a blur! If you’ve read this blog before you know that this time of year is the craziest for me with work and football. But some respite is on the horizon, and none too soon. Minor football is done for the year, so I’m no longer doing double and triple duty coaching. No championships for either of the boys, but I know they had a lot of fun on their respective teams. Next year they are both moving up, with Ethan going on the PeeWee and Noah stepping up to Atom. Tomorrow is the last day of high school football as well; for the third time in four years we are playing in the championship game. We finished the regular season at 4-1, and defeated Hammarskjold in Tuesday’s semi-final game to make it this far. We are playing our sister school St. Ignatius for the second year in a row, who accounted for our only loss of the season. It’s supposed to be -5C with 30-50kph winds…wish us luck! Besides the regular grind of work, the other thing keeping me busy is planning another trip to Europe. In 2017 Canada will be marking the 100th anniversary of the Battle of Vimy Ridge. Our board has graciously allowed us to go on the excursion and join the thousands of other Canadians who will be there. There has been a lot of interest in the trip and the toughest part is going to be selecting the lucky 21 who will make the trip. Departure in 881 days! As you can imagine with the insanity that is my life I have not had a lot of time to devote to railway stuff. I have spent a little bit of time here and there doing some research or transcribing notes, but nothing major. Once things slow down a bit I’ll be back at it. However I did have the opportunity a few weeks ago to take a break from the grind and spend some time doing fieldwork. I also got to spend some quality time with the boys on Canadian Thanksgiving weekend…two of the things I’m most thankful for. This trip would be my second visit this year with my good friend John at the Cross River Lodge on Gunflint Lake. 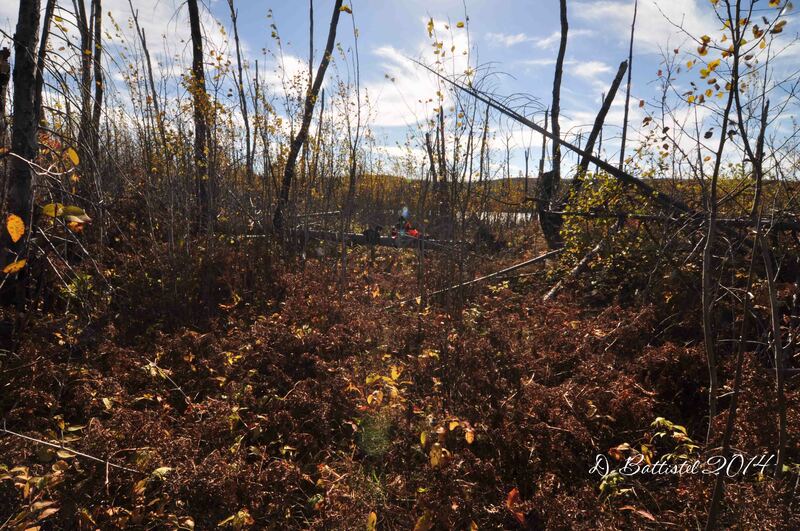 The purpose of this expedition to the bush was to take a look at portions of the Gunflint and Lake Superior Railroad, much as I had done in the summer. Before that, I had last been on the G&LS back in 1997, which was a very long time ago. Much has changed since then, especially after the 1999 blowdown and 2007 Ham Lake fire. There were also sections of this railroad that I had never been on, and that did not appear on any maps, so I would be heading into some real unchartered territory. It was supposed to be a beautiful weekend, so I decided to take the day off on Friday so we would have almost three full days of hiking. After a brief stop in Grand Marais for some food, we arrived at the lodge by 9am local time. A short time later our gear was stored and we were on our way across the lake. If there was only one complaint from the weekend was how windy it was on the lake. It is a 10 km ride to the east side of the lake and the wind it a rough and chilly ride. With extra layers, gloves and a toque, I felt like I was going to Siberia! The objective of the first day’s hike was to explore about a kilometre’s worth line along the south shore of the lake. We beached the boat at the same backcountry campsite we used on our previous visit in August and proceeded up and over the ridge between the lake and the grade. The trek was much easier this time with the cooler temperatures and the lack of underbrush. A few minutes and 90 metres later we were standing on the grade. It was much warmer and less windy away from the lake, so we had to take a moment to shed a layer to keep from overheating. We would first head east along the former right of way, a distance of about 400 metres, which would take us to a point just south of the former logging camp. Here we would have to turn back, as approximately 50 metres of grade has been submerged by a rather large beaver pond. The journey west would cover almost 900 metres, a walk highlighted by the beautiful fall folage. A few metres west of our original starting point resides one of the great locations along the whole G&LS. On my 1997 trip I discovered a spot where a section of rails had been left in place; in August the boys and I re-acquired these rails and marked them on the GPS. These 40lb. rails had been purchased from the Illinois Steel Company in the spring of 1905 and are marked “Illinois Steel Co. Union 92 IX.” The absence of foliage made the couple sections of rail in this area a bit more visible than they were in the past. 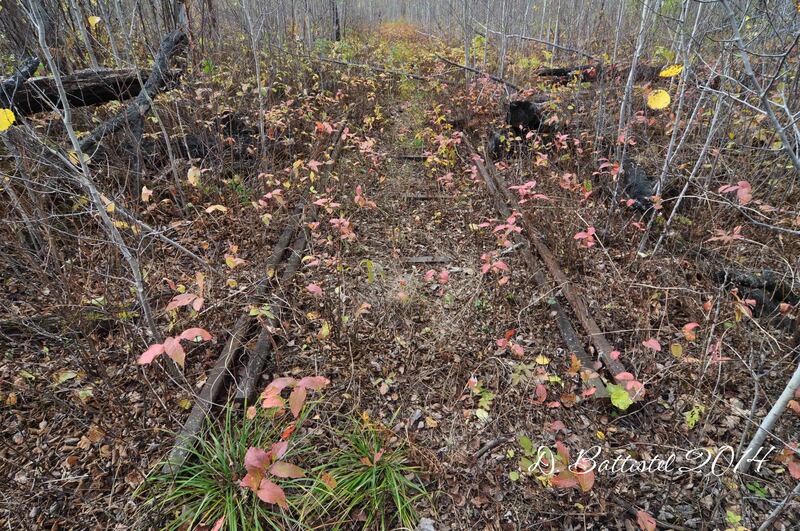 A short walk further west brought to another section of rails that we had discovered back in August. These rails were unique as they were clearly part of a junction that formed a spur or siding. The ties are gone, but very visible are the metal spacers/separators for the rails. Working back east, I was able to determine that this was the western end of a siding. It is not indicated on the International Boundary Commission map which was surveyed in 1911, but it is very clear from the grading work on the ground. With a very steep ridge just south of this location, it makes perfect sense to have a siding in this spot to shunt loaded log cars in preparation for the trip over to North Lake. Beyond the junction the incline of the grade grows increasingly noticeable as it passes through a cutting on a small hill before it turns south alongside the Crab River. 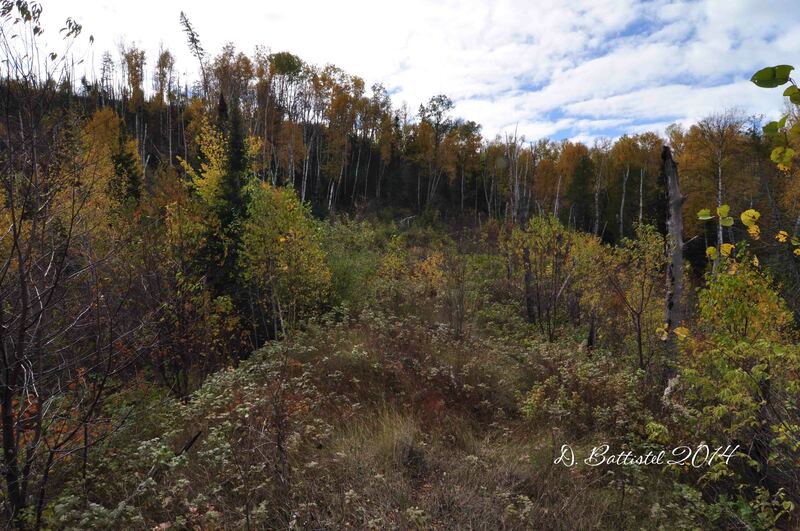 To climb the large ridges south of Gunflint Lake, the railroad used the small hill to gain elevation. Instead of constructing an elaborate trestle to bridge the valley between the hill and the ridge, the engineers filled the chasm with corduroyed logs until they had the necessary angle and topped it all with gravel. This expedient structure was built around 1905 and lasted for 102 years. I was in awe when I saw it back in 1997, these stacked logs towering over my head. I would still be there today had it not been for the 2007 Ham Lake fire. The corduroyed logs, possibly soaked in creosote, were burned and stubbornly smoldered throughout the winter of 2007-2008. Afraid of potential flare-ups, the US Forest Service had to dynamite the trestle in March 2008. Log Trestle, Gunflint Lake, October 2014. The boys and I climbed 75 metres over the remains of the trestle and headed southward through the rock cut that had been blasted into the top of the ridge. After another 125 metres we arrived where the Border Route Trail intersects the railroad grade. We decided to follow the trail westward over the Crab River and then took the short branch to the north that bring you to Bridal Falls. After heading back to the boat, it was across the lake to the lodge; unfortunately the wind had picked up and was now howling from the northwest. We absolutely froze on the ride, me more so as my face was being pelted by spray as I attempted to cut the whitecaps. It took me quite a while to warm up afterwards! The next day we were up bright and early, and after the boys had (second) breakfast at the lodge, we started toward the east side of the lake again. It was already windy by the time we left, so I knew it was not going to be a pleasant ride back. Our task for the day was to follow the grade along the Crab River southward to Crab Lake. 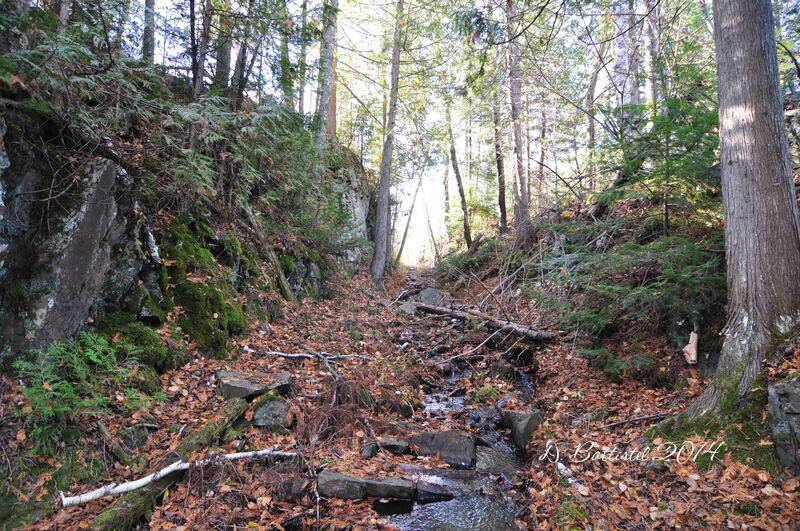 It would not be an easy walk, as there are very few traces of the railroad beyond Bridal Falls. We left the boat on the shore of a small bay and walked the 500 metres of trail to the falls. From there we picked up the branch of the Border Route Trail that took us back above the falls. Our journey would be further complicated by a discovery we had made the day before; since my visit in July, beavers had dammed the river above the falls, flooding the grade for an unknown distance. I had to leave the boys for a few minutes while I probed for a way around the flooding. It took us an extra 100 metres of walking to detour around the pond, but eventually we got back on track. Rock cut, Gunflint Lake, October 2014. Back on the grade, we followed the line south for another 140 metres before we reached another swampy area. The boys waited at the edge while I tried vainly to see if I could find any traces of the grade. After a little bit of wandering around I decided to see if the I could find something closer to river; big mistake! My misplaced step put me up to my knees in freezing cold water, which instantly flooded my rubber boots. The boys thought it was rather amusing as I sat on a rock and poured muddy water from my boots and attempted to wring out my sodden wool socks. 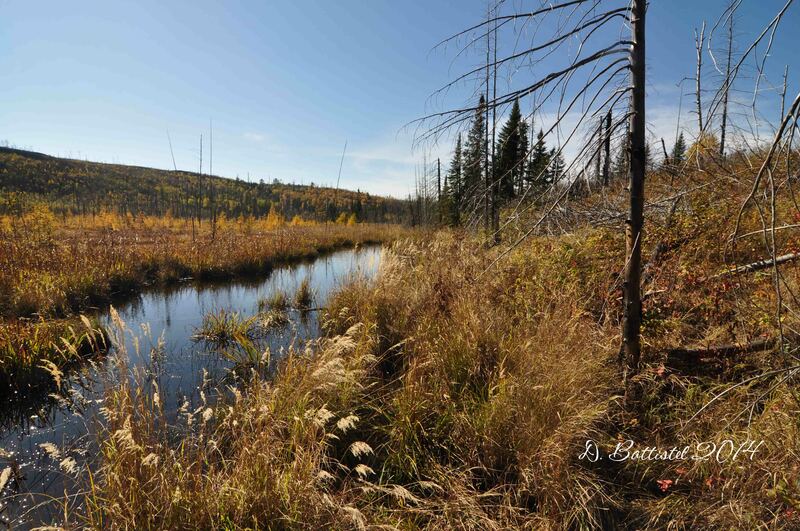 With the route of the grade in doubt, we found a trail that would take us southeast to a small lake formed by a bend in the river and cut out about 300 metres of walking (it was already getting tough on the boys). When we arrived at the lake I left the boys to eat a snack while I hiked westward along the shore of the lake to see if there were any traces of the grade. I walked about 120 metres and in two places found what appeared to be corduroyed logs sitting just below the surface of the water. Collecting the boys, we headed east and then south along the shore for another 200 metres. Where the lake narrowed back into a river we saw evidence of what appeared to be blasting work through some rock for about 90 metres. A short distance later we passed through a small cutting and then reached Crab Lake. The boys sat and ate their lunches while I pushed further ahead a little bit along the shore. I was pretty sure I was on top of the grade, but there was no way I could drag the boys another 800 metres to the other end of the lake…it was time to head back. Cutting, Crab Lake, October 2014. We stopped briefly at Bridal Falls so I could take some photos of this very breathtaking cataract. I first saw the falls (also known as Bridal Veil Falls) back in 1997 and I have been back several times over the years. The boys were anxious to get back, so we didn’t linger very long, but I was able to get a few good shots. 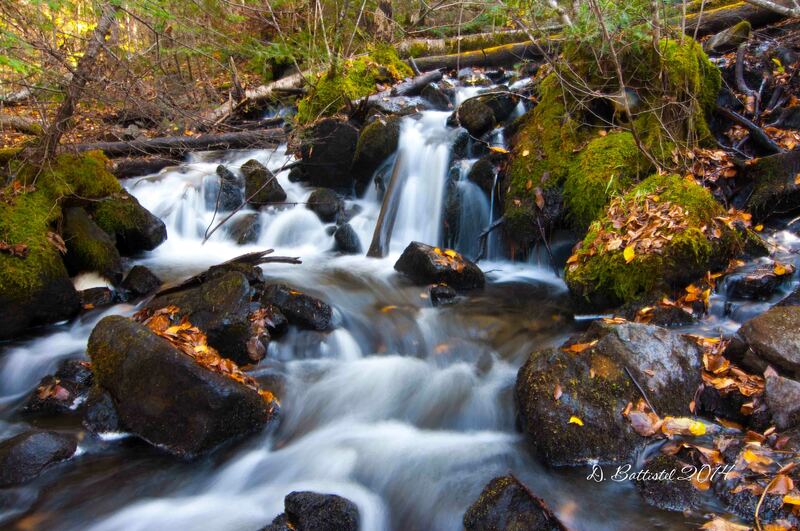 Bridal Falls, Gunflint Lake, October 2014. The wind was howling again on the lake, this time much stronger from the west. Gunflint Lake is surrounded by high ridges on both sides of the lake and is oriented in an east-west direction. With a maximum depth over 200 feet and no features to impede the wind, it can become downright nasty when the wind is from the west. Poor Noah had the bumpiest ride of his life as we battled the whitecaps across the lake; I was very glad to finally make it back to the lodge! I had promised the boys we would go “out” for supper one evening and Saturday was that day. After a wonderful shower in our room, we headed over to the Gunflint Lodge. 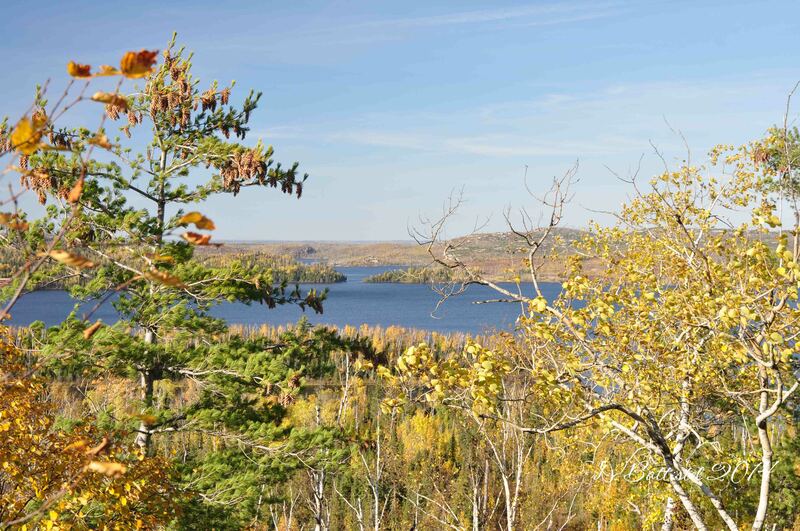 We stopped for a quick hike along part of the Border Route Trail, which affords a spectacular view of the lake, especially the Gunflint Narrows. The meal at the lodge was fantastic; based on our previous experiences on portion size the boys split a triple-decker club between them. Dad opted for the Royal Trifecta, which on paper seems like a coronary waiting to happen. But since I walked 4.5 km cross-country and didn’t eat much, I demolished the hogie bun layered with ham, pulled pork and bacon with a great amount of gusto. It was delicious! Our last day of hiking was “supposed” to be easier than the previous one, but as usual it didn’t turn out that way. 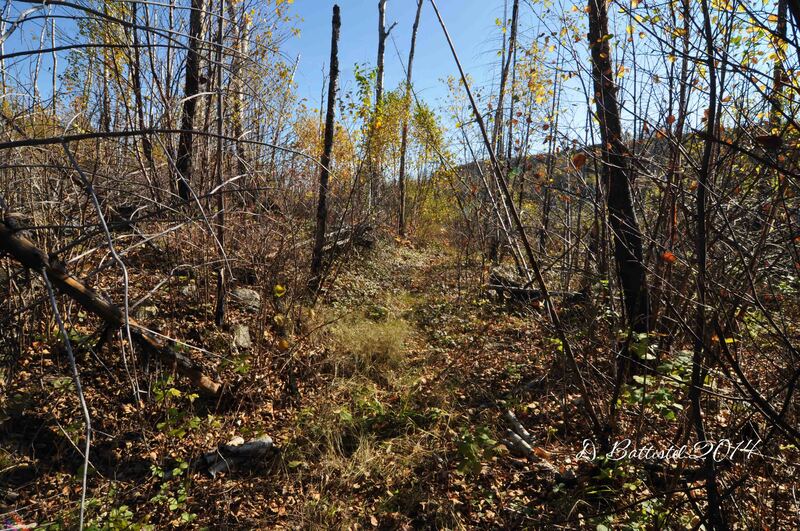 The plan was to head north along the grade from the site of Camp 4 to where it crossed a creek, a distance of 1.5 km. Unfortunately the route proved much more difficult to negotiate than I anticipated, with a lot of deadfall from the blowdown and fire impeding our progress. As with the previous days, it was quite cool on the lake, but we were forced shed layers on the walk, even though we were a short distance from the shore. We were forced to zigzag our way along the grade, climbing over or under fallen trees and chopping at branches in our path. We only made it about 400 metres before we turned back, since I knew the boys would not be able to handle the breaking trail work much longer. On our way back, we came across a solitary rail just a few metres north of where Camp 4 was located. I tried to find some markings on it, but it was too badly worn. These rails, from the main line of the PAD&W to the camp, were originally laid by Canadian Northern crews in the fall of 1902. Afterwards the boys went back to the boat for lunch while I spent some time poking around the site of Camp 4 and shooting some video. I’ll have to get back at some point and see if I can turn up anything new or interesting. After the boys had “recharged” with some food, we were going to finish the day by hiking from Camp 4 approximately 350 metres to where the grade is flooded by the beaver pond. Most of it was fairly easy to follow, though it does get a bit sketchy were the grade meets the dam and beyond. When we reached the eastern side of the flooded cutting we had hiked to on Friday it was time to turn back. The next morning we headed home bright and early (and of course the lake was nice and calm). It was Thanksgiving that day so we had to give mom a hand getting dinner and the house ready for our guests. Hopefully the boys remember these expeditions when they get older…I told them they could tell their kids about their grandfather and his crazy hikes. I know I will cherish these times forever.